As the adoption of containers becomes more widespread (and thus budgeted projects increase too) I am fielding an increased number of questions from large enterprises looking to achieve the best ROI with containers. Everyone is aware of the incredible time-to-market benefits that containers offer for cloud-native app development; however, this currently accounts for a relatively small percentage of portfolios overall and may even be limited to one or two strategic applications. Therefore, I am advising enterprises that containerizing existing apps presents the best opportunity for accelerated ROI. Allow me to expand a bit on why that is and how Apprenda’s Cloud Platform (ACP) makes it significantly easier. 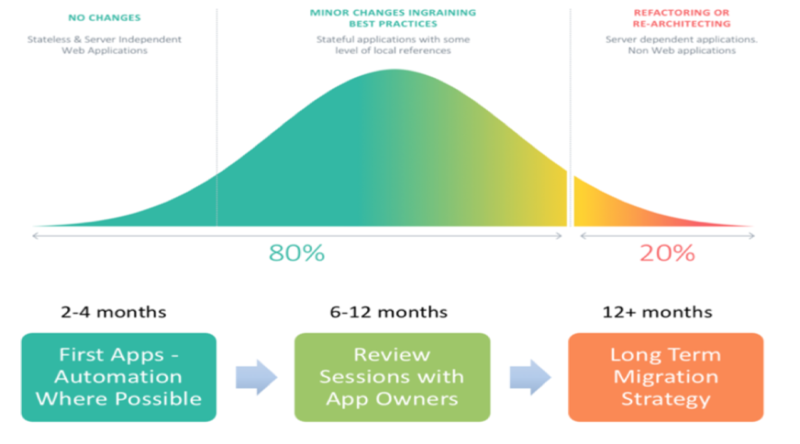 Spoiler Alert: Without wishing to give too much away, a senior executive I work with (from a top 10 US bank) described the situation pretty succinctly when he said “New app development is why I purchased Apprenda, existing apps is how I paid for it”. I think he summarizes my argument in just a few words – and better than I ever could. But, here goes. During a traditional cloud migration project, cloud value-adds (such as application high availability, scalability, etc.) are not inherited until after applications are rewritten with the necessary cloud architecture changes and then physically migrated to the cloud. At this point, and only this point, organizations reap the benefits of cloud adoption. One organization I’m currently working with has been collaborating with an outside consulting group for over NINE MONTHS and were still waiting to inherit these wonderful benefits. The time and money invested in this project were fast approaching the seven-figure range and applications were not yet in production. This is a sizeable investment and an obvious reason why some organizations are hesitant to adopt cloud infrastructure. By utilizing a few ACP modernization functions (which can be found in a fantastic article by a member of our CS team, here), developers can easily adapt existing applications to become portable and cloud-ready within hours (or days depending on how deeply coupled the applications had been to underlying infrastructure). Apprenda helps fast track the process of bringing existing applications to the cloud as quickly as possible. This ensures that investments can be made in more innovation-centric activities that are more important for future success! By utilizing container technology, ACP can help migrate existing applications to the cloud with little to no rewriting necessary. Now, in the interests of full disclosure, not all applications are made for a platform like Apprenda. With that said- my team has experienced quick value-add for large sections of a relatively new client’s application portfolio within phase one of adoption. We have experienced an aggressive velocity of 8-16 applications being modernized and migrated per week as a project standard. An additional client (a “big 4” accounting firm) even modernized and migrated a record of 71 applications within a single day! Below, you can find the typical portfolio breakdown of application modernization efforts within an organization. Apprenda’s platform will, most likely, not be able to modernize and migrate every application from day one, but we will help your organization gain the quick 80% migration ROI with little to no changes, and then develop a plan for the remaining applications. This is faster than any manual migration project timeline by a long shot. Hosting an app on a server is like placing an egg in a box without protection: there are inherited risks associated with deploying additional applications (adding more eggs to the box). It’s important not to crash or decrease performance of those applications (or, crack the eggs), so the typical model ends up being one application per server, which comes with safety relief but also a large waste of utilization. Now, let’s think about the container model for application deployment. By deploying applications within containers, organizations can start to experience multiple applications safely be stacked on top of each other (or multiple eggs within egg cartons), efficiently utilizing the most resources available per that environment. Infrastructure utilization, therefore, can increase from 10, 20 or 30% to a utilization jumps upwards of 70-90, with the assurance that ACP is monitoring application health and will redeploy a new version elsewhere if any issues occur. By utilizing the Apprenda containerization model, initial and future infrastructure ROI is controlled and more efficient. Another organization engaged with my team spent two years mired in a large migration project with another cloud vendor and were on their way to realizing the benefits of the cloud. However, they were experiencing difficulties with spiraling costs associated with cloud migration and usage. After adopting ACP, they were able to dramatically decrease their current (and future) infrastructure spend by utilizing a containerization deployment model. 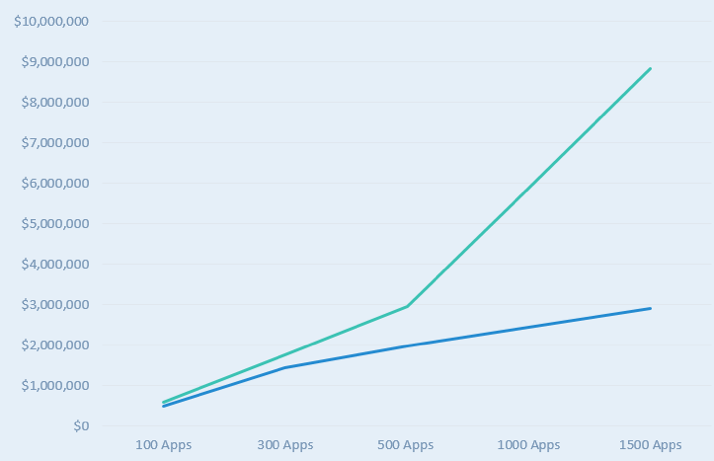 As seen in the graph below illustrating cloud server count savings associated with that particular project – in this instance Apprenda will save approximately $7 million across the existing app portfolio included in the SoW. In summary, all organizations are becoming software companies – they’re all writing software in increasing volumes and thus driving digital transformation and disruption. That said, most large enterprises still have significant portfolios of existing applications in dire need of modernization. The good news for enterprises is that Apprenda is here to help bridge the gap between your legacy and digital future. The fact that we have one platform that supports cloud native and existing apps means that I (and my Apprenda account manager colleagues) can help you write better cloud native apps faster and have your legacy apps pay for it.